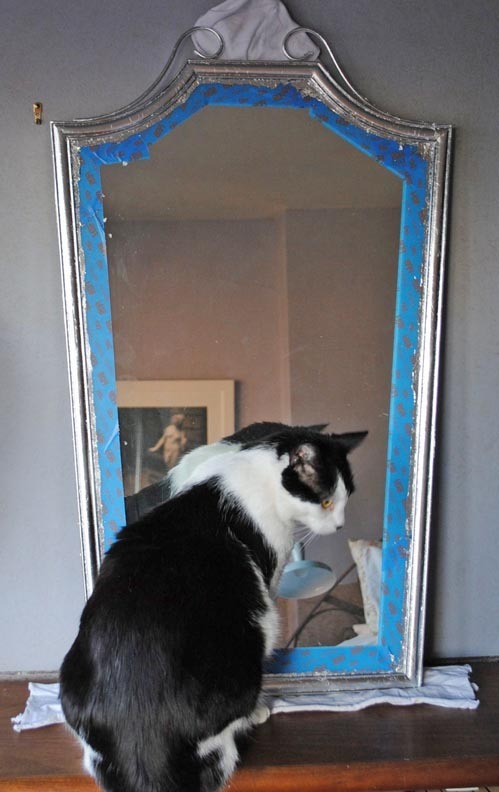 An interior designer recently asked me to gild a mirror frame. 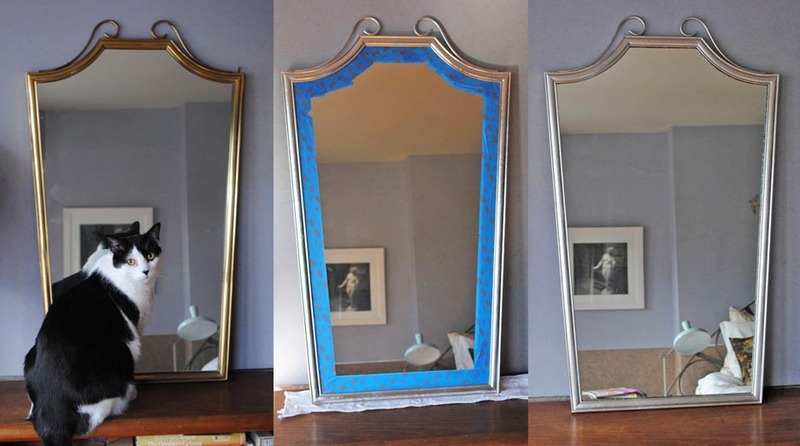 The frame was brass, and he wanted a silver leafed frame instead. 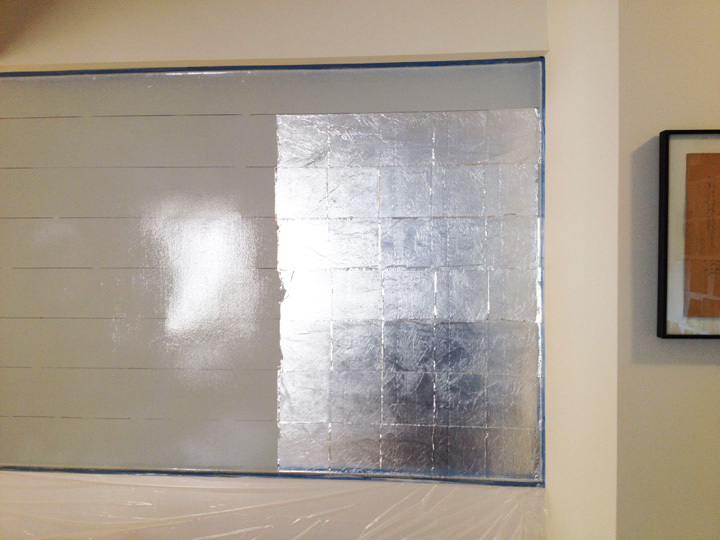 I suggested switching the leaf to aluminum because silver tarnishes in unpredictable ways, even after varnishing. 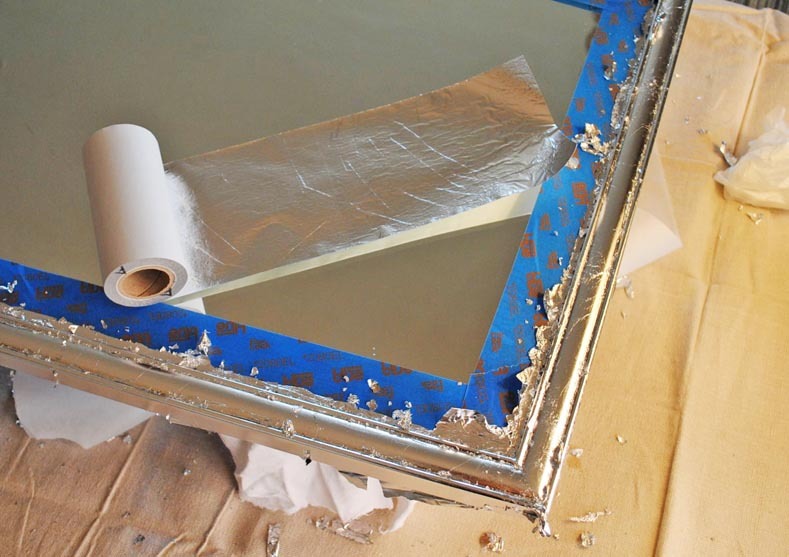 The frame would look like silver leaf, without the headaches. He agreed, and we were good to go. 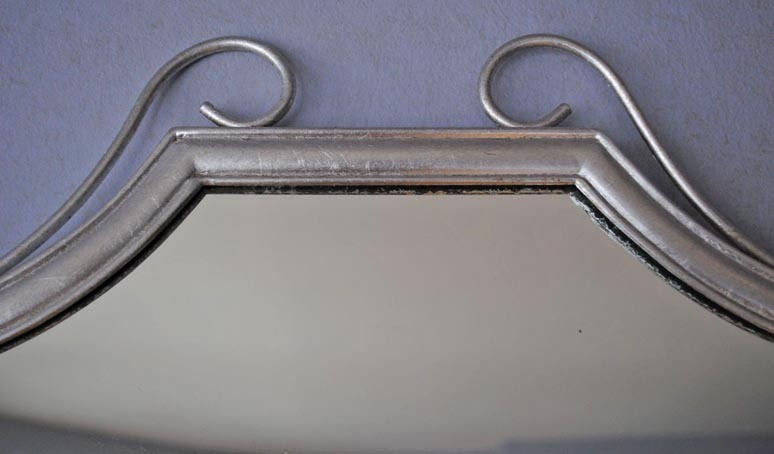 Here’s the original mirror frame. 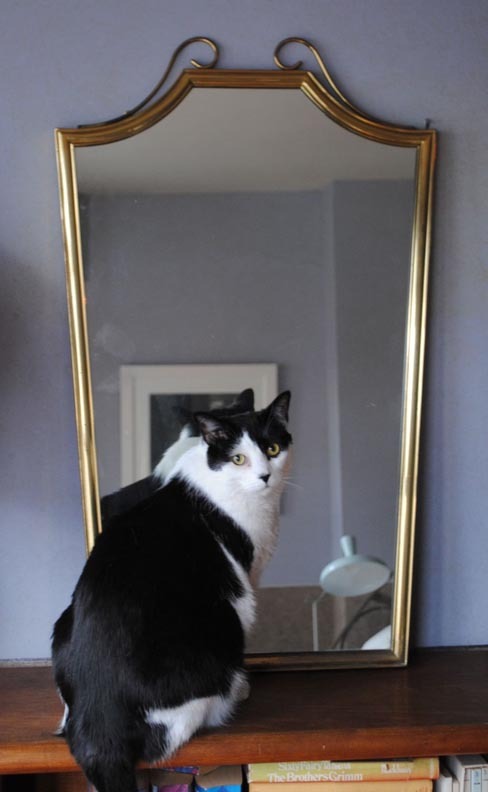 The mirror was 33 inches high and 22 inches wide (84 cm x 56 cm). My cat, Little Roo, couldn’t resist investigating. 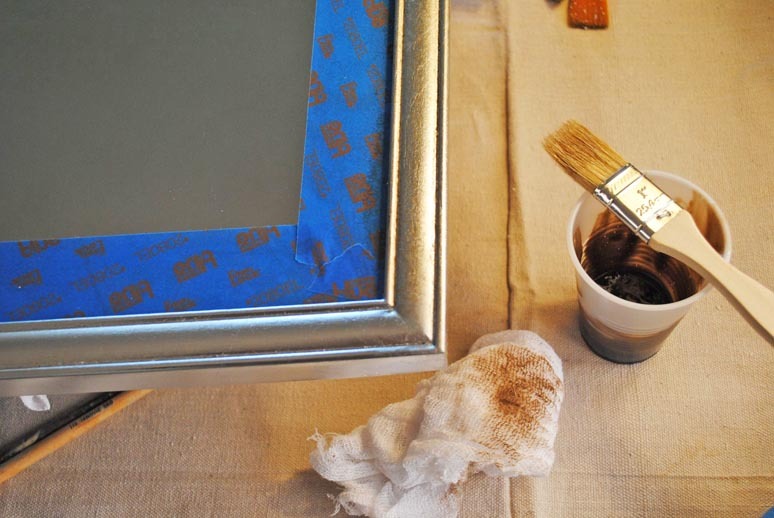 In any painting or gilding project, prep is your friend. 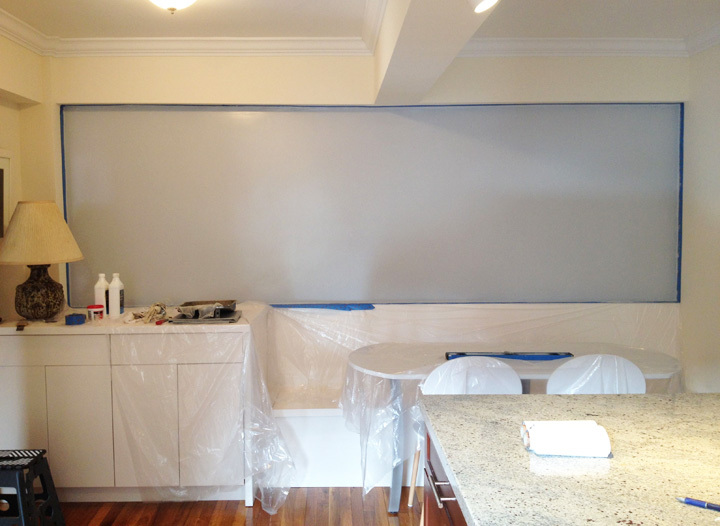 The better your prep, the less clean up you’ll have to do when you’re done, and the quicker the job will go. 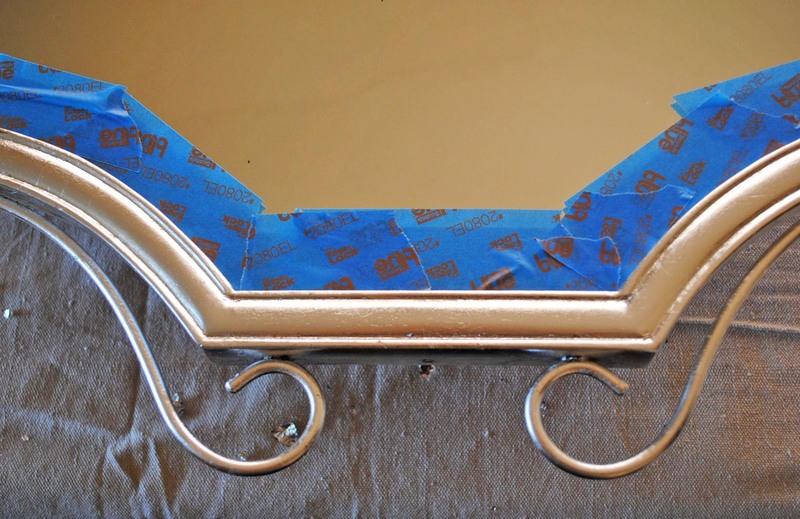 I taped off the mirror next to the frame using blue low-tack painter’s tape to protect it. 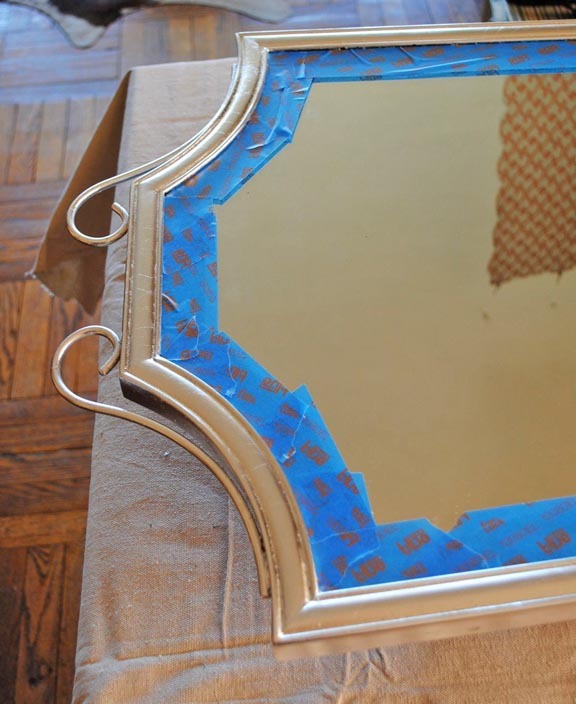 The mirror was raised up on four paint cans to bring it off the table, which allowed access to the sides of the frame. The table was protected with a drop cloth. 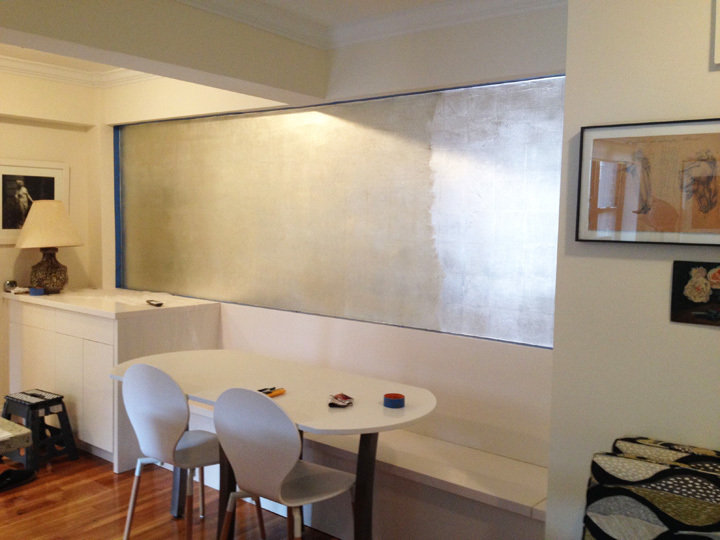 Gilding begins with sizing. 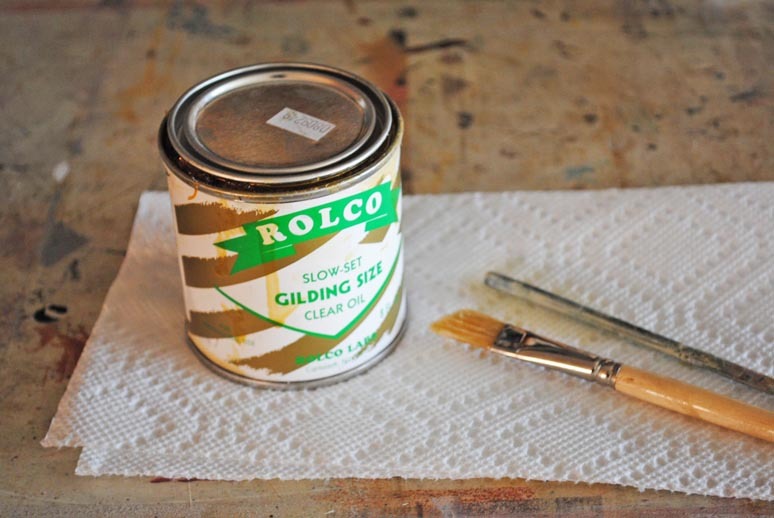 Size is an oil- or water-based type of glue specifically made for gilding. In this case, I used slow-set oil size, which levels out as it dries so you don’t see brush marks. 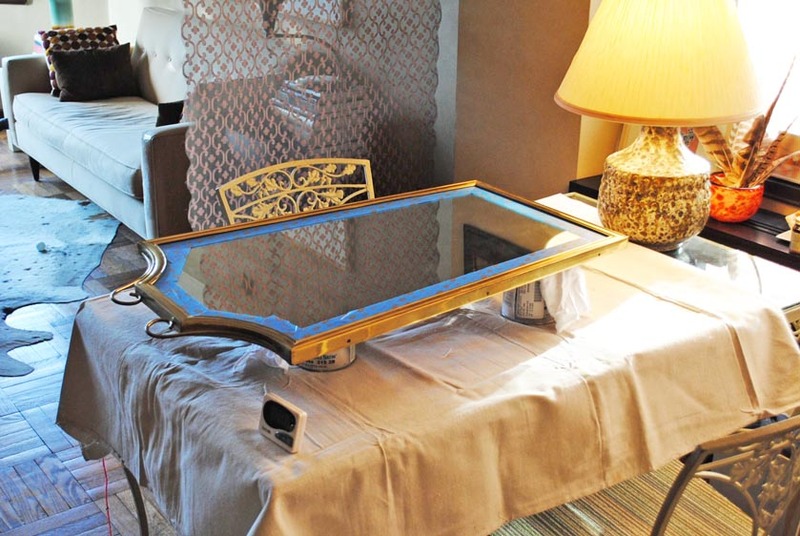 Gilding is usually done over a painted surface. I crossed my fingers that the size would stick to the brass. Luckily, it did. I mixed the size about 5:1 with mineral spirits. 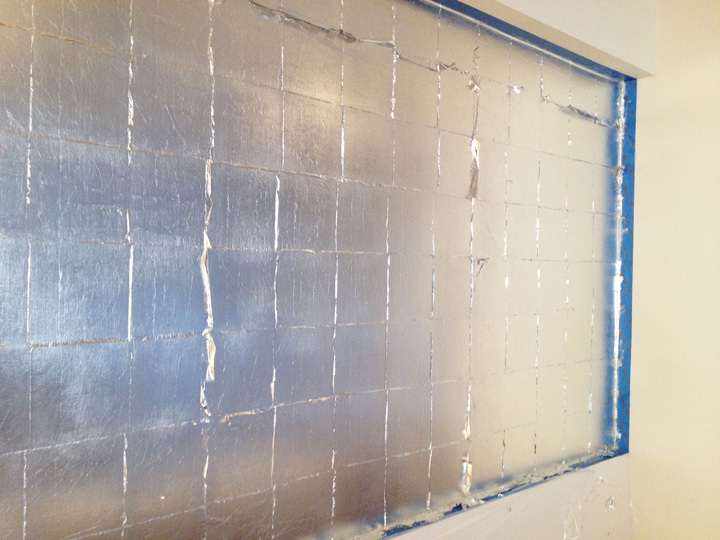 This sped up the drying time of the size, which is usually about 10 hours. Thinned out, it dried to the correct tack in about an hour. I applied it with a half-inch wide natural bristle brush, sizing 5-inch sections at a time, gently blended the size out to the edges and brushed back and forth a few times to blend the last section into the next. I wanted an even coat; no pooling, no missed spots. The size is colorless, so it’s hard to see where it is. It pays to work slowly and to use a light’s reflection to see where you’ve been. Below, you can’t tell what has been sized and what hasn’t. 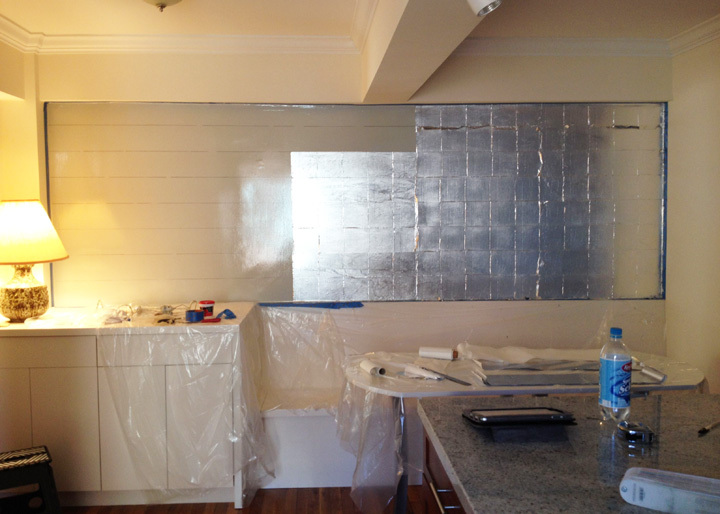 The size has to dry to a specific tackiness before gilding can begin. Too wet and the metal leaf won’t dry; too dry and the metal leaf won’t stick. The correct tack is found at the squeak: if you gently drag one of your knuckles along the surface, a gentle squeak will be heard. Too wet and your knuckle gets stuck and mars the surface; too dry and there’s no squeak, although there’s a window of at least an hour when the squeak is right. So don’t go out and start running errands! Stand by, set a timer and wait for the squeak. Luckily, I had a leftover roll of aluminum leaf to work with, which saved the hassle of buying a small amount of leaf. I like to work with rolls, which have individual sheets of leaf laid next to one another, overlapping by 1/8 inch. On the frame, it will look like each leaf has been applied individually, but by using the roll, the process is speeded up. I gilded one side of the frame at a time, cutting the appropriate length of leaf off the roll. 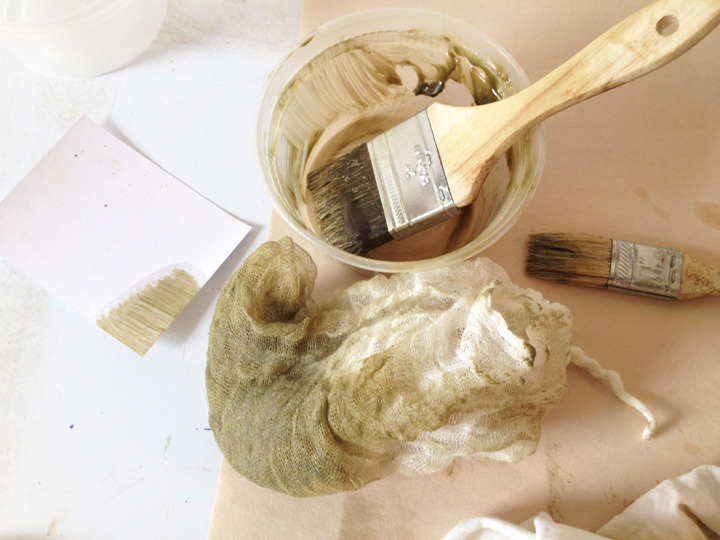 To apply the leaf, I used a soft brush to gently push it to the surface and stuck it down through the backing paper. It’s important to remember that the oil size below is still wet, and therefore the leaf is now wet and is delicate, so it has to be treated gently. Also, try to avoid touching the leaf; you may leave finger prints. Any cracks or missed spots were filled with little pieces of leaf until the surface was completely covered. 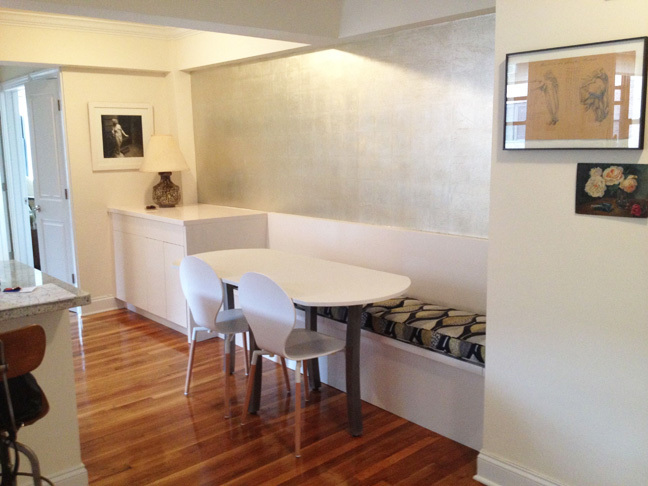 Gilding makes a real mess; tiny specks of leaf drift to every corner of the room. Somehow, I managed to miss a spot when sizing. No problem, I just applied more size, let it dry for an hour, did the squeak test and applied more leaf. Since the surface was delicate, only a general clean up could take place. I removed the big hanging pieces of leaf and gently brushed off the bigger flakes. No pressure and no rough handling at this point. The size has to dry overnight before the leaf can be thoroughly cleaned. There’s still a lot of extra leaf on the frame. The frame has dried overnight and it’s time for the real cleaning. Using soft cheesecloth and a soft brush, I wiped and brushed the surface until all of the remaining bits and pieces of leaf fell away. Although the leaf was now properly adhered, I didn’t want to scratch it, so I still handled everything with care. 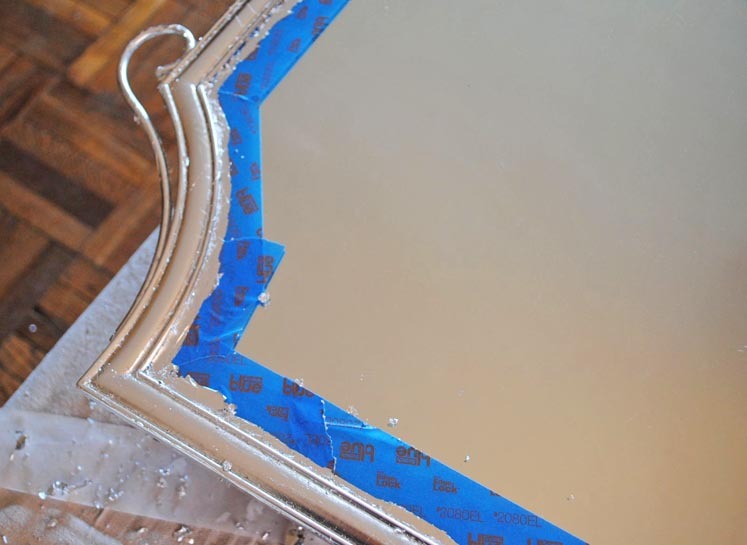 Once I was done, I took off the tape and cleaned up the inner edge, then taped the mirror again for glazing. 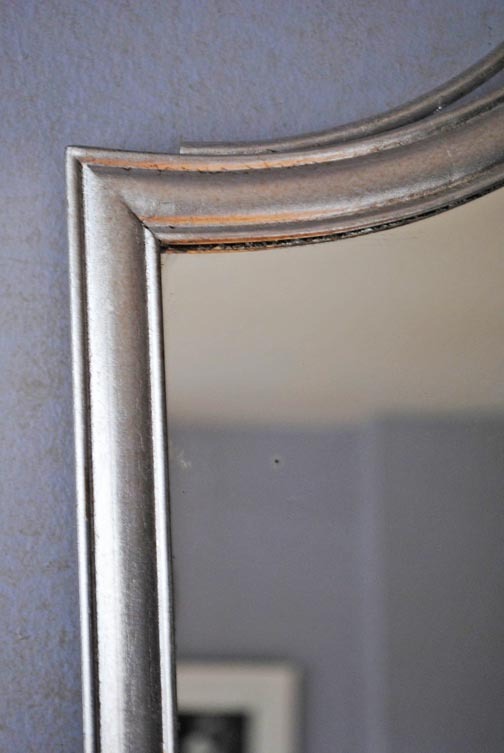 The designer wanted a soft aging glaze to cut down the brightness of the aluminum, which is glaringly reflective when fresh, but he didn’t want the frame to look dirty. 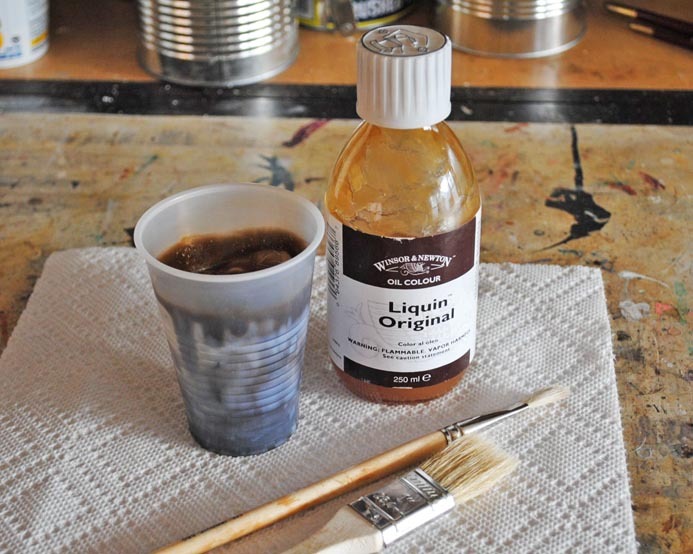 I mixed up a glaze using Windsor & Newton’s Liquin Original, which is an oil medium and the only medium I’ve found that is transparent enough to use as a giaze over gilding. I added in a blob of raw umber from a bottle of universal tint, mixed it up and the glazing began. 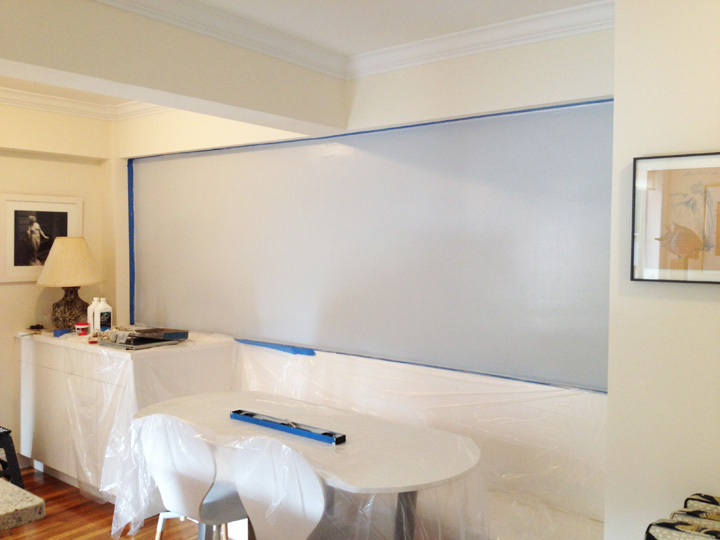 The color looked quite dark when mixed, but once applied and manipulated, it was a sheer, light wash of color. I brushed it on with a one-inch wide chip brush, then pounced the surface with cheesecloth, taking most of the glaze off again. Below, the vertical edge is glazed while the horizontal one isn’t. You can see the warmth added by glazing in this color. 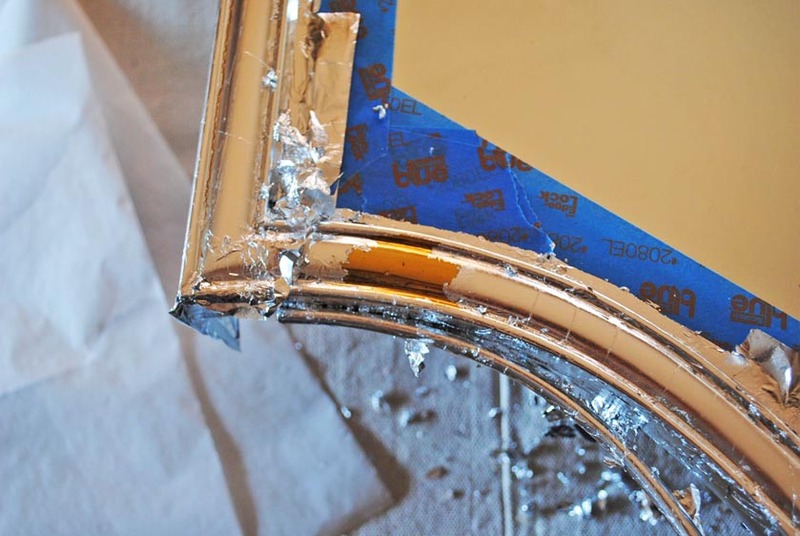 The glaze gave depth to the frame’s surface without calling attention to itself and reduced the aluminum’s glare. 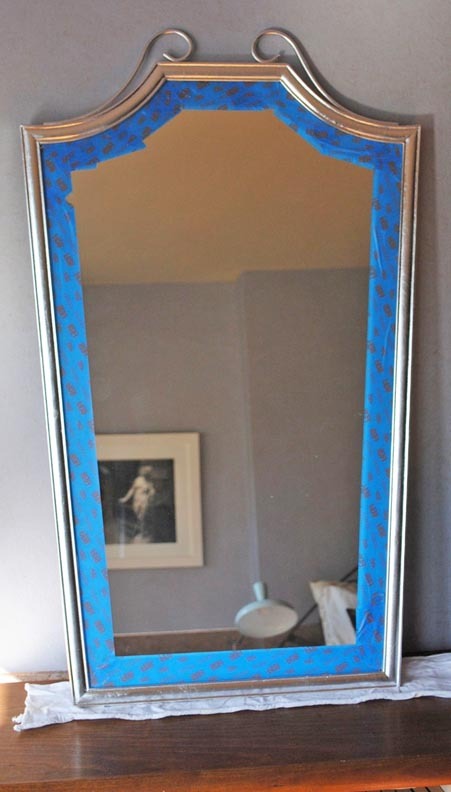 The mirror dried overnight again, the tape came off, and voila! A new frame. Total time for the whole process was about six hours. With the glaze, the look of the leaf became softer and it seemed to glow instead of shine. Here’s a comparison of the original brass, before glazing, and after glazing. I love these jobs! 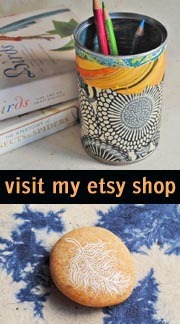 it’s such fun to transform a piece in this way. 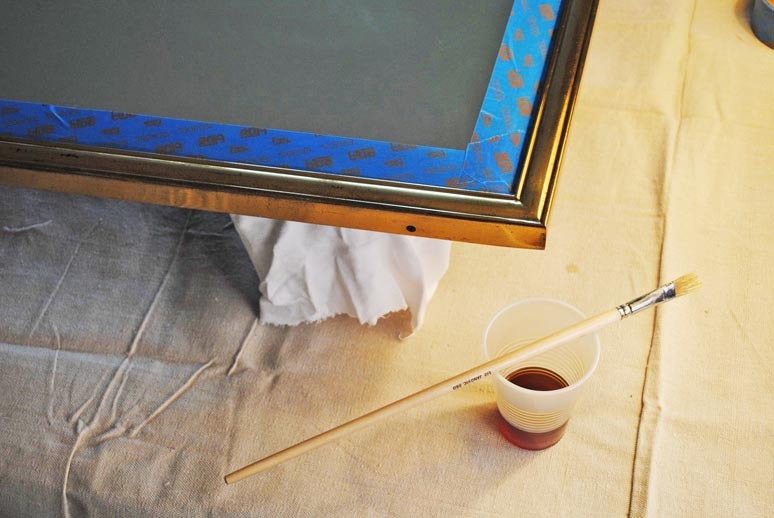 The term “gilding” usually refers to applying gold leaf to a surface. 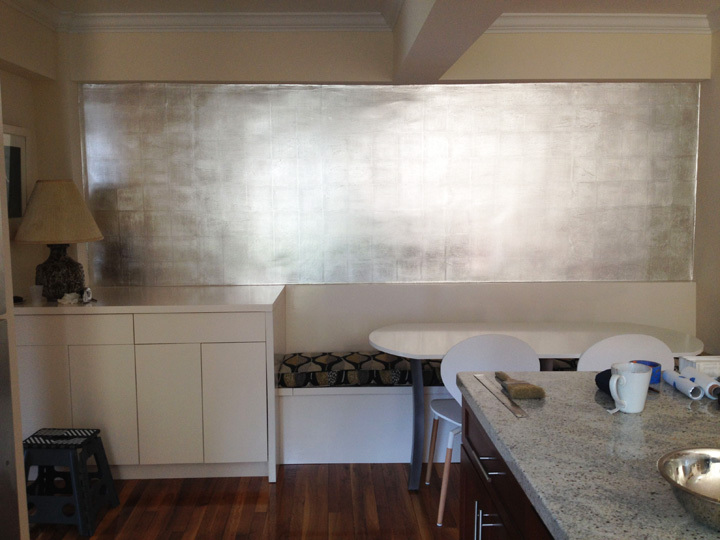 To make life easier, I use the term to describe any metal leafing, whether it’s gold, copper, silver or aluminum. 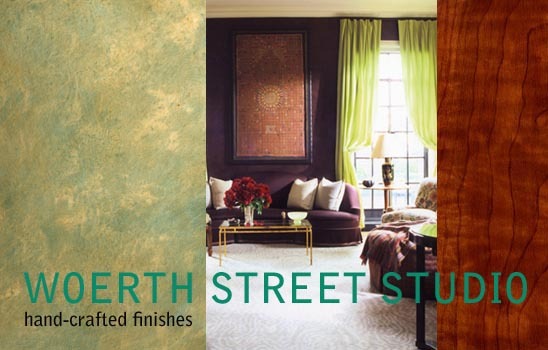 These are the entry doors to a loft in Tribeca in lower Manhattan. 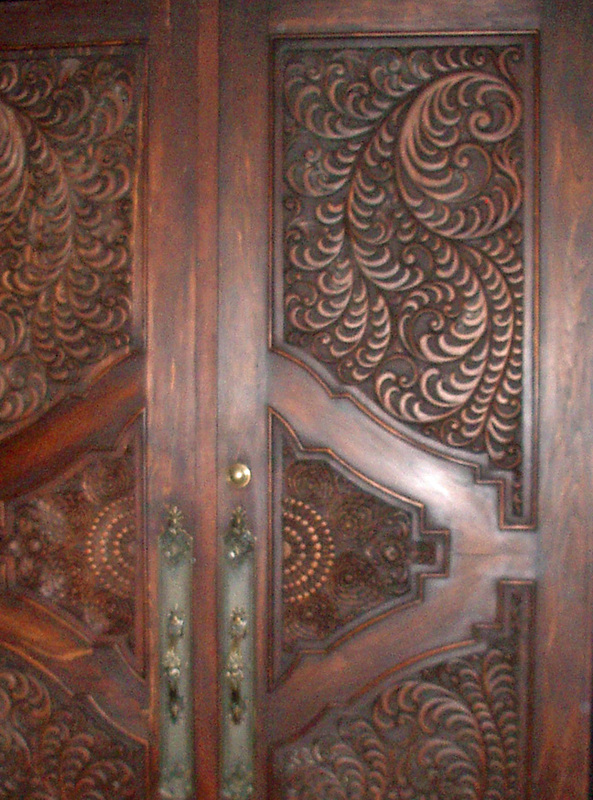 As you can see, the original surfaces are carved wood. 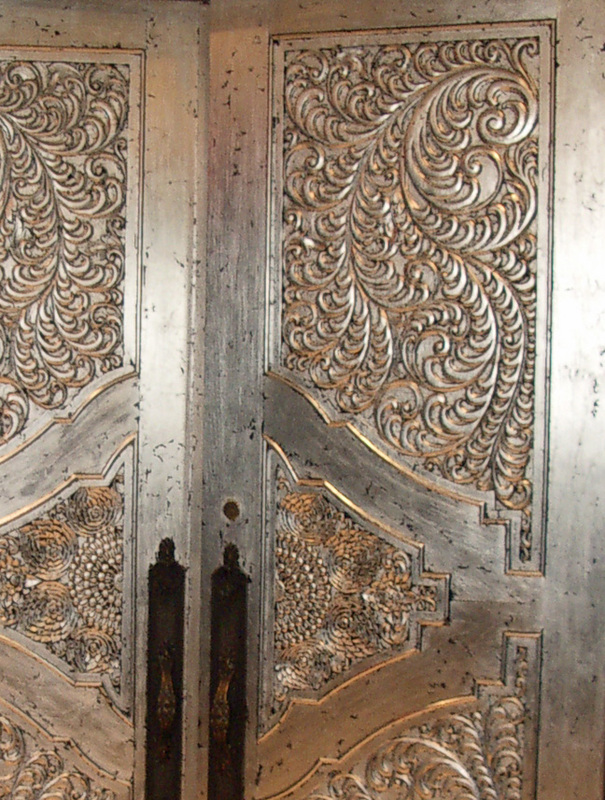 I don’t know where these doors came from; they’re beautifully designed and detailed. 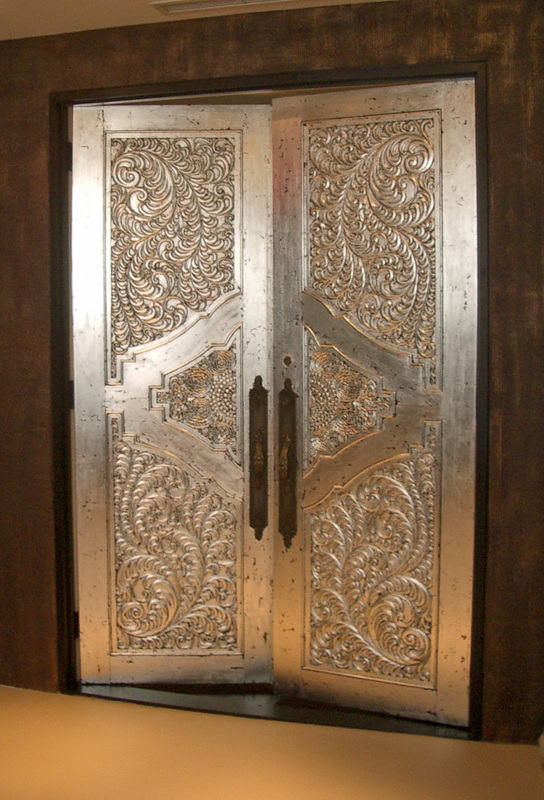 I love the original finish, but the owners of the loft are musicians who entertain often; they wanted a front door with major bling. 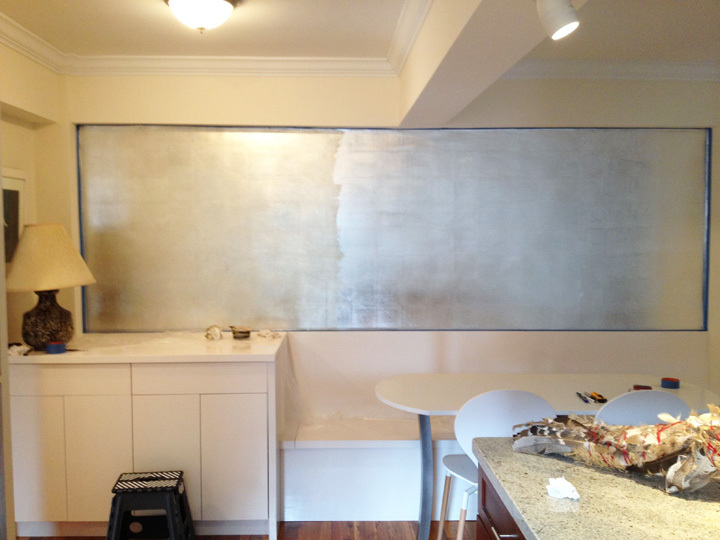 The designer asked me to create a distressed silver leaf finish. Here’s a close up of one door. Lots of intricate detail to take into account when figuring out the work schedule. 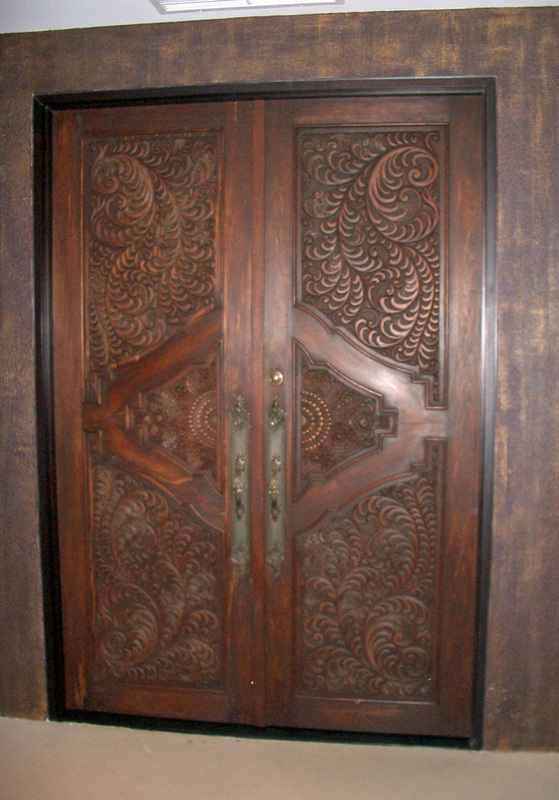 These are the finished doors. 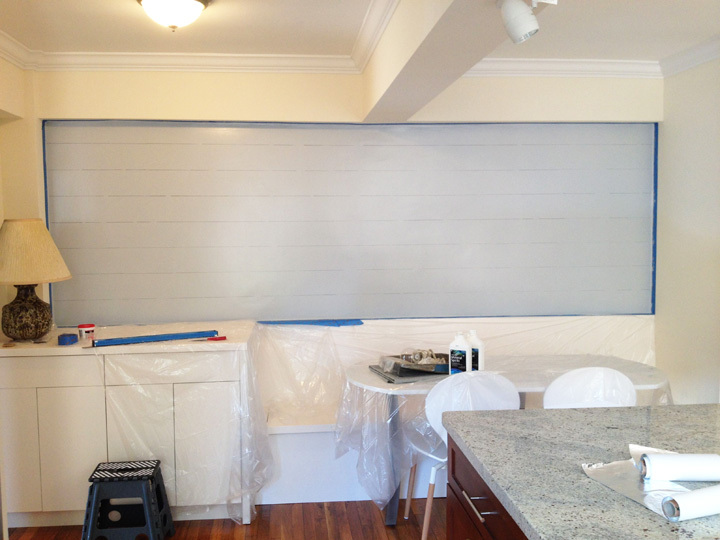 It’s unusual to gild directly on top of wood in this way; normally, two coats of paint are applied to create a sealed, smooth surface. In this case, though, we wanted the leaf to be broken and patchy, so applying the leaf straight to the wood helped achieve this goal, since the size (the glue used to adhere metal leaf to surfaces) absorbs into lightly sealed wood unevenly. 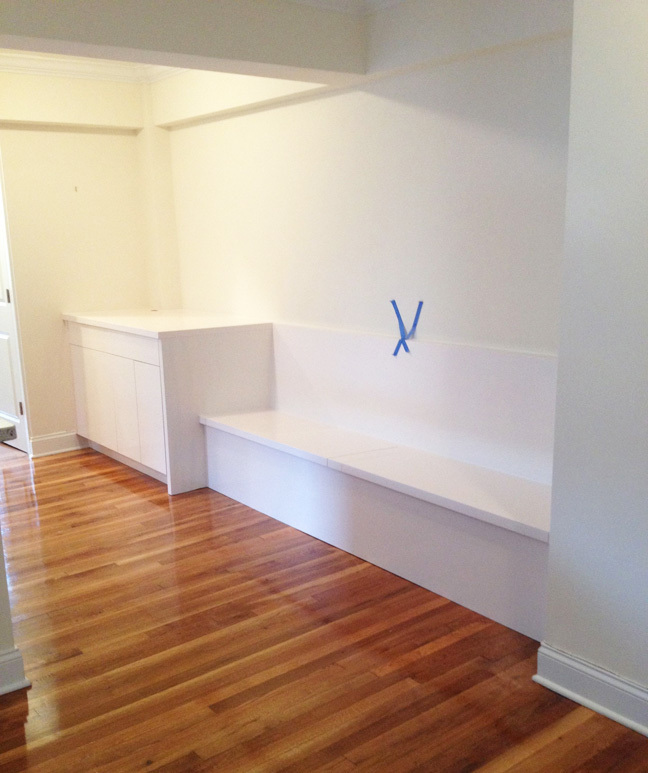 You can see the final finish better in this close up photo. The doors are varnished for protection. 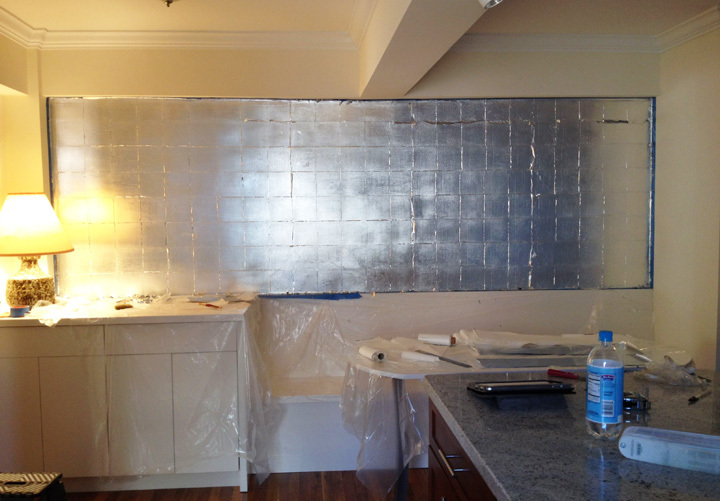 I used aluminum leaf instead of silver leaf because silver leaf tarnishes like crazy, sometimes even after being sealed. 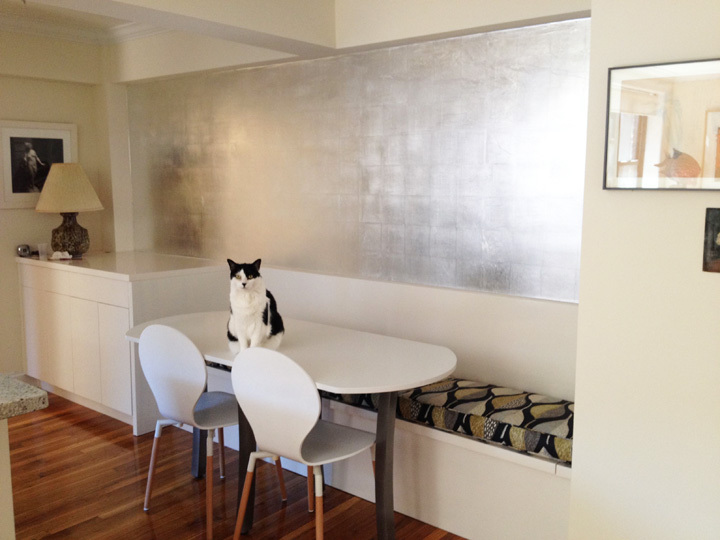 Aluminum leaf doesn’t tarnish. (Gold leaf of 22-karat or higher won’t, either.) Tarnished silver slowly turns amber, then black. Hmm, want to lie awake at night with worry? Me neither, aluminum it was. 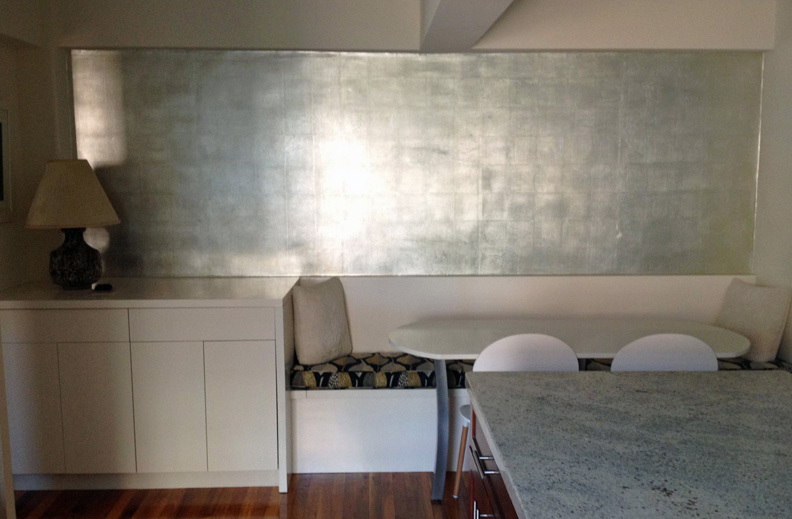 Metal leaf is incredibly thin, the thinnest sheet of metal you can get. It’s so light it flutters in the air and can fly away in the breeze. It’s so thin it’s almost transparent; gold leaf will melt between your fingers. Of course, it’s also reflective. 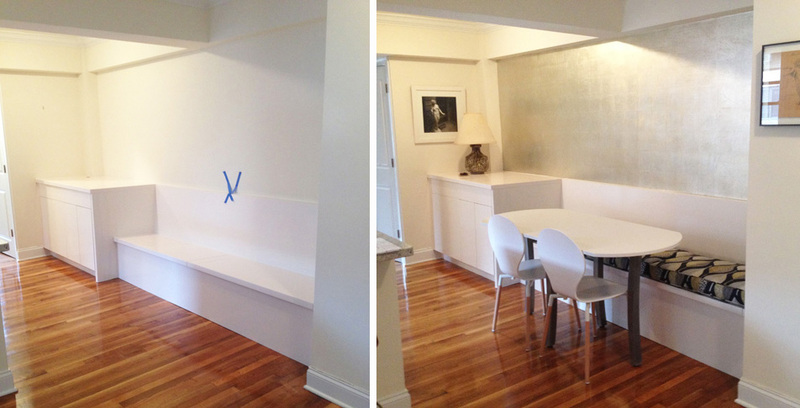 In the two photos above, the lights over the door are on and bounce off of the creamy stone floor, creating an amber glow. 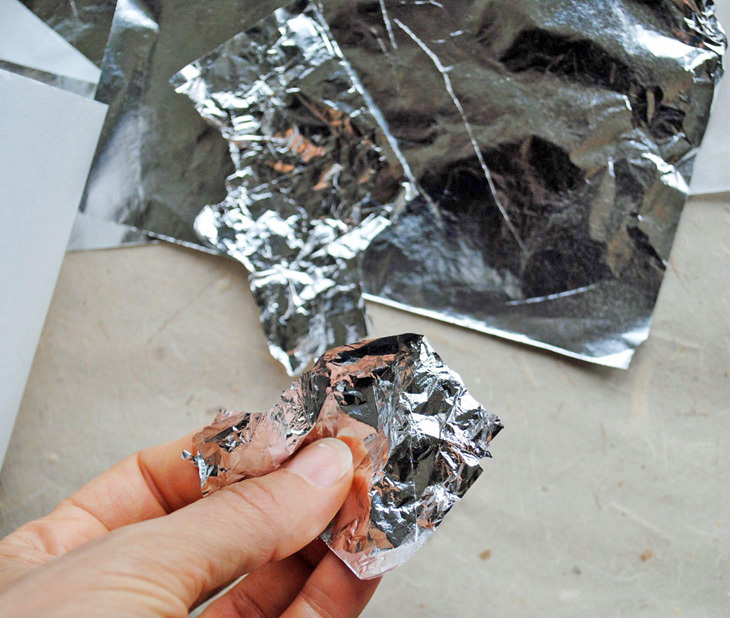 Here’s what aluminum leaf looks like. I have loose leaf in my hand. 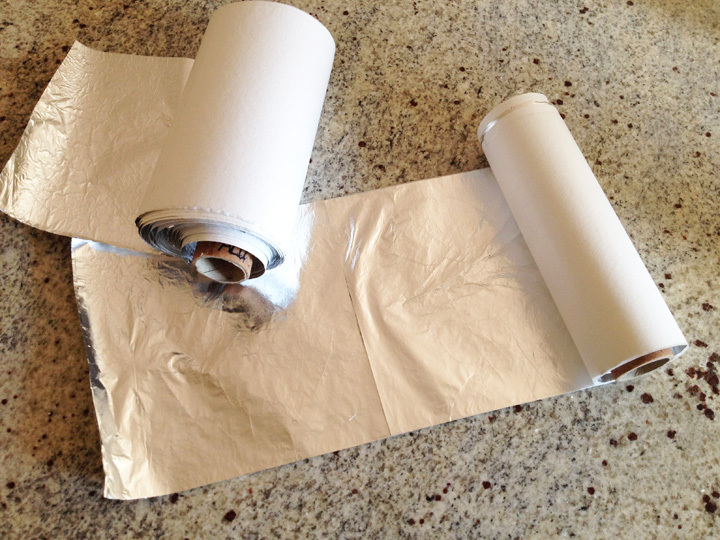 In the background is a roll of aluminum leaf, which sticks to its white backing paper with static cling. You’d actually never hold leaf in your hand this way because the oil from your fingers might leave a mark, so the leaf is manipulated with brushes or through the backing paper. 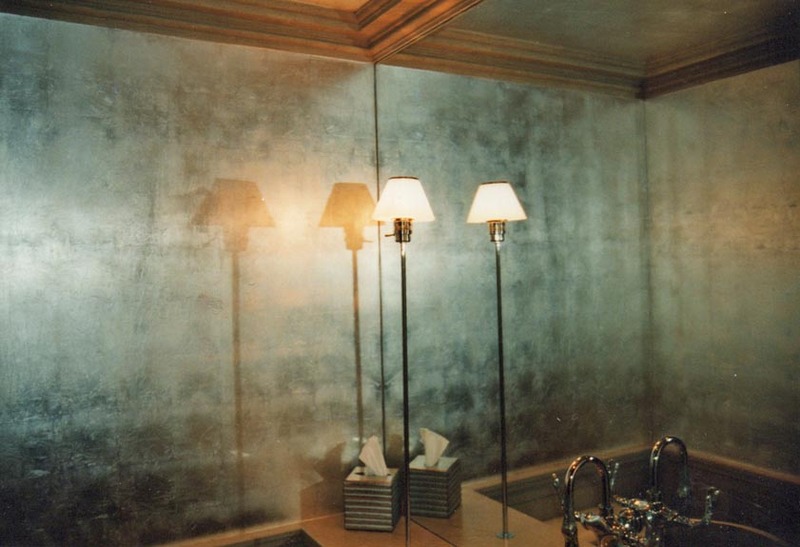 Below is a powder room whose walls have been aluminum leafed. 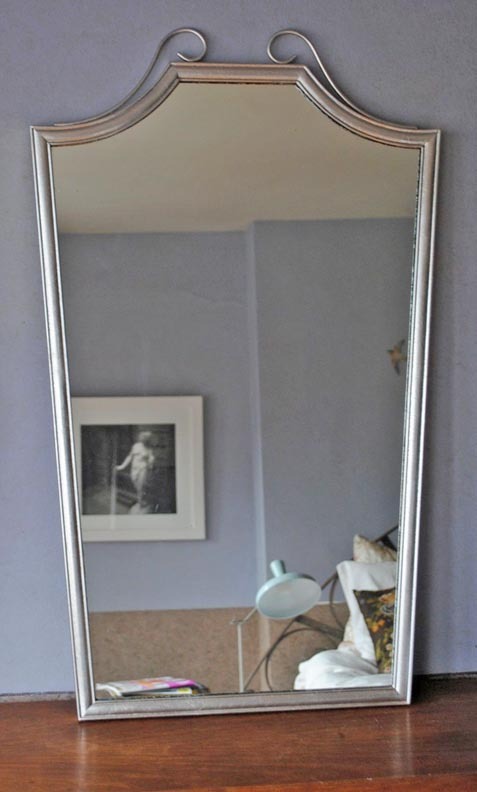 The right side of the photo is a mirror, reflecting the opposite wall. When you leaf large surfaces, the 6-inch wide leaves create a grid pattern, since each leaf overlaps the next one by 1/8 inch. 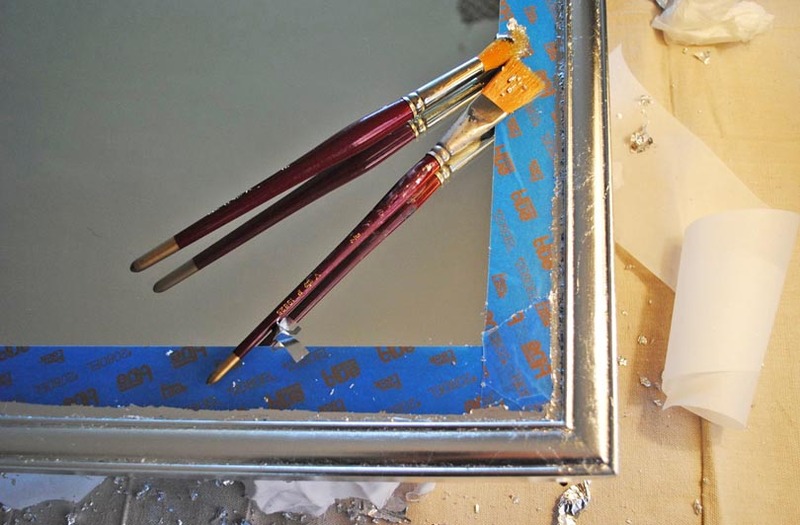 This means you have to be mindful of gilding in straight lines both vertically and horizontally, since any drift will be obvious, and mistakes can’t be fixed without redoing the whole wall. 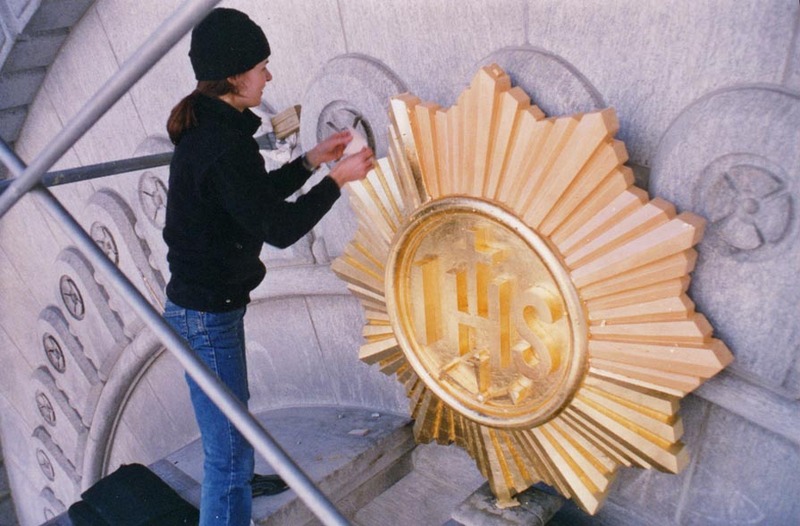 Here’s my all-time favorite gilding job, gold leafing an ornament on the exterior of a church in Chelsea with 24-karat gold. Ever tried gilding six stories up, outside in the wind? Wow. I won’t even tell you how much gold went flying away! This took three days, standing on scaffolding over the stone arch of the window. Lucky I’m not scared of heights! It was such fun. 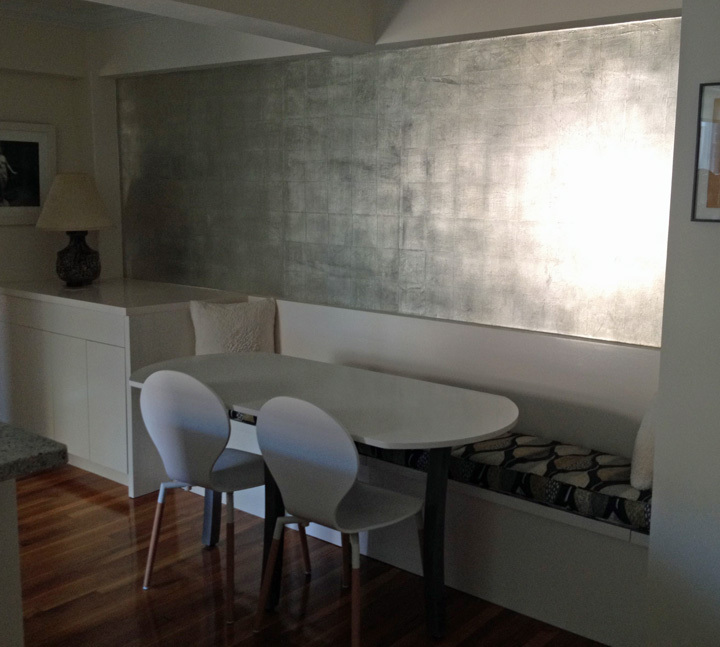 Gilding is sublime; it’s quiet and meditative, with spectacular results. There’s no rushing or sense of urgency, since I break the surfaces into sections and can gild only when the size has dried to a certain tackiness. A most satisfying way to spend a day.